Final Fantasy 15. The Final Fantasy 15 movie Kingsglaive. Final Fantasy 7 Remake and the Final Fantasy 7 20th anniversary just six short months away. Square's classic role-playing game series is having a moment, its first major moment in a long time. People are genuinely excited about Final Fantasy again. That's why there's no better time to take a long look back at one of the series' most divisive entries. 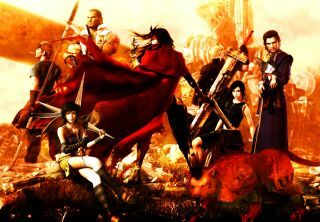 Released ten years ago this week, Dirge of Cerberus was the Final Fantasy 7 sequel that first attempted to turn the series into an action RPG. The results varied depending on the player. (Actually it all depended on how much you like the pop star Gackt.) To celebrate the game's tenth anniversary, we revisited Dirge of Cerberus for an extended play session. Dig the show? We broadcast every Tuesday and Thursday live on Twitch at 1:30PM PT/4:30PM ET/9:30PM GMT.